The governor of Maryland, Lawrence J. Hogan, JR., recently signed into law House BIll 1065. With its introduction on May 8, 2018, title service agents in the state have to meet new requirements for their licensing and operation. Among the most important changes that affect your title service agent business is that you now have to obtain a higher surety bond amount. You need to post a $50,000 Maryland title agency bond as a part of your licensing process with the Motor Vehicle Administration. Below you can find the most essential details you should keep in mind about the new state act for title service agents. HB 1065 amends the licensing requirements for title service agents in Maryland. It increases the amount of the required surety bond from $25,000 to $50,000. The bond is one of the main criteria that agents have to fulfill prior to receiving a state license from the Motor Vehicle Administration. The purpose of the bond is to guarantee your legal compliance. It can be used to compensate a customer who suffers as a result of potential illegal actions on your side. The maximum reimbursement that a harmed party can seek via a bond claim is the bond amount you have posted. Thus, with the bond increase, claimants can now file claims for up to $50,000. The new act also introduces clear rules regarding recordkeeping of taxable sales. Title agents have to duly preserve all invoices and other sales documents, so that they can be consulted and used by the Administration. In addition, the bill sets that you can keep the lesser of $12 per vehicle or 0.6% of the gross excise tax that you have collected and remitted on behalf of the Administration. In order to obtain the surety bond that you need, you do not need to cover the whole amount, which is now doubled to $50,000. Getting bonded requires covering only a small percentage of that amount. In the most common case, this bond premium is in the range of 1% to 5%. Your exact surety bond cost depends on a number of factors. When you apply for a bond with a surety provider, it has to consider your personal and business finances. The most important criteria that affect your price include your credit score, as well as company financials and assets and liquidity. In some cases, your professional experience in the field may also be important. By examining this wide array of factors, your surety can judge how risky it is to provide you with a bond. The bond price will be lower if your overall profile is stable. 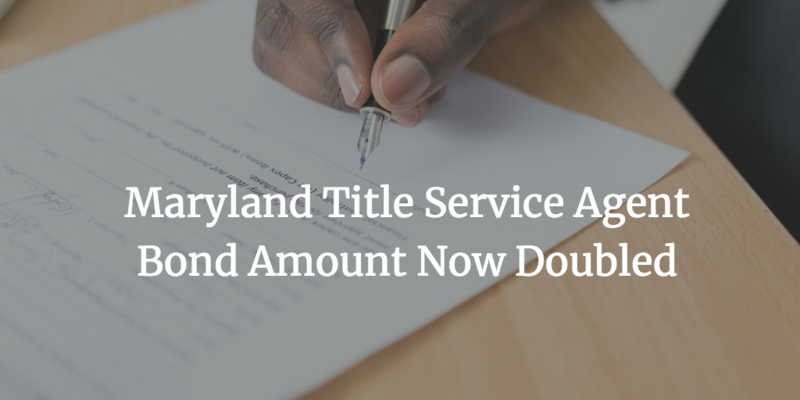 As the bond requirement for Maryland title agents has now been increased, the new bond cost may be on your mind. But you should not be alarmed because your price may not change drastically. In fact, you can work on polishing your personal and business stats, so that you can lower it. Even with the higher bond amount of $50,000, you can pay as little as $500 to get the bond you need for your licensing. Do you have further questions about the surety bond increase for Maryland title service agents? We’re here to help. Just call us at 877.514.5146.